Our Nursing Associate work-based apprenticeship enables healthcare employees to study for a foundation degree in nursing whilst in paid employment. Must be employed for 30 hours or more in a healthcare setting. Level 2 Functional Skills in English and mathematics, or GCSE Grade C or above. Our Nursing Associate apprenticeship enables new and existing healthcare staff to study for a fully-funded FdSc in nursing whilst in paid employment. Delivered by experienced Registered Nurses, the flexible, work-based programme provides you with the knowledge and skills to support the provision of quality healthcare. You'll become an important part of the nursing family, helping to make a difference to individuals, their families and communities. @ No course fees – costs are covered by the government and your employer. @ Earn while you learn – remain employed and receive a full wage while studying. @ Ongoing support – guidance from experienced academic tutors as well as qualified staff for the duration of the programme. 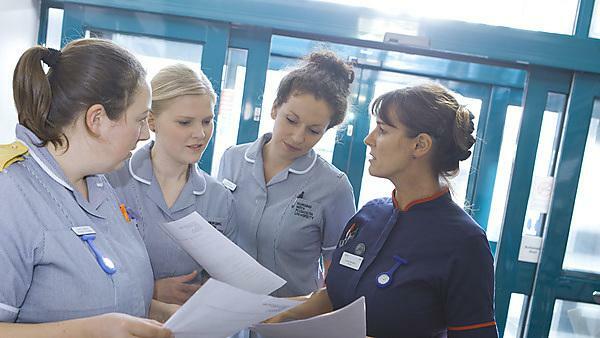 @ An education provider you can trust – our reputation in delivering high quality nursing education for 20 years, as well as internationally renowned research, has enabled us to become the largest provider of healthcare education in the South West. Designed for employees working a minimum of 30 hours per week in a healthcare setting, who would like to obtain a professional qualification in nursing whilst continuing to earn a salary. Two-year course with attendance at University one day a week. For the duration of the programme you’ll split your time between study and guided practice, undertaking placements in a variety of settings. Following completion, apprentices will have the opportunity to continue their studies with a view to becoming a Registered Nurse. Delivering high-quality, person-centred care, underpinned with evidence-based knowledge. Communication and interpersonal skills, and working within therapeutic relationships. Team working and leadership skills, and using research to support change and innovation in your workplace. Professional values which underpin modern healthcare practice. Both Year 1 and 2 of your nursing associate apprenticeship will include six modules of study, each of which will be assessed. Where possible, assessments will be linked to areas of practice you are working in, giving you the opportunity to demonstrate your personal learning and development. In addition to continuous assessment and maintaining a Portfolio of Evidence, upon completion of the 45 week course you will undertake an ‘End-Point Assessment’ (EPA). This will be provided by an independent External Assessor and will include an observation of nursing practice followed by a discussion about the professional domains of Nursing Associate practice. Anatomy & Physiology for Nursing Associates. Assessment in Nursing Associate Practice. Managing Care through Planning, Implementation & Evaluation in Nursing Associate Practice. Therapeutic Relationships through Effective Communication. Nursing Associate Professional Values and Parameters of Practice. Supporting Teaching, Learning & Assessment in Practice. Developing Nursing Associate Skills and Practice.